identified from an image by C. Caldwell c1950 on Trove (Previously Picture Australia) of an image held by State Library of Victoria, of which I am a member. That image is of the upper level only, but shows the windows and the fancy piece of stonework high in the centre directly above the front door. 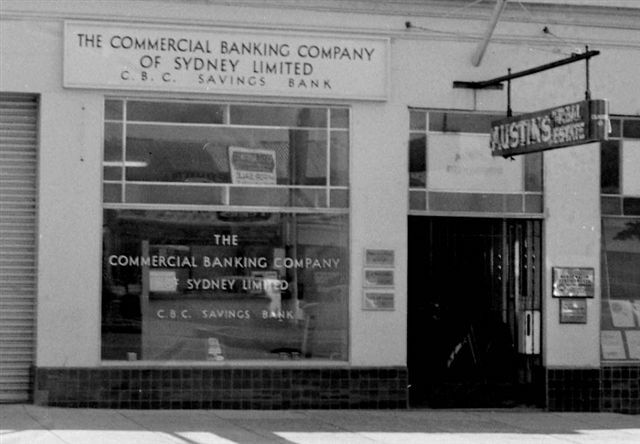 The image is tagged as Commercial Bank of Sydney Armadale and dated 1950, but the architecture strongly suggests that is was originally a Bank of Victoria branch. 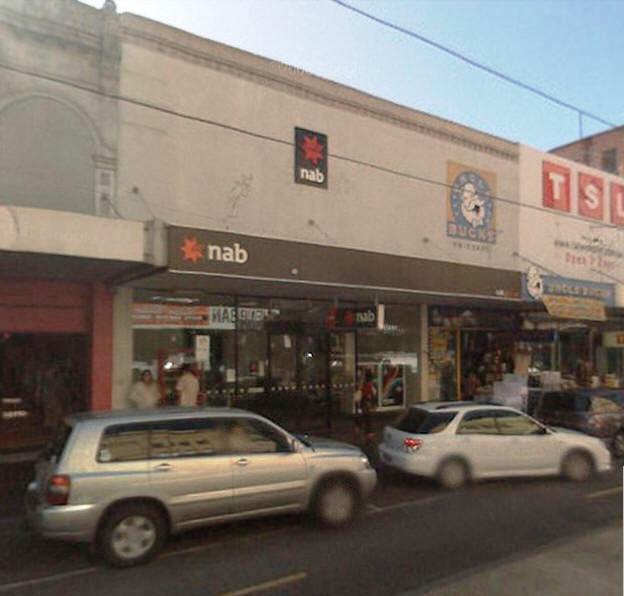 2010 July John Beer notes: 275 Brunswick St Fitzroy CBC became NAB now replaced with FlexiTeller as shown on Google photo. 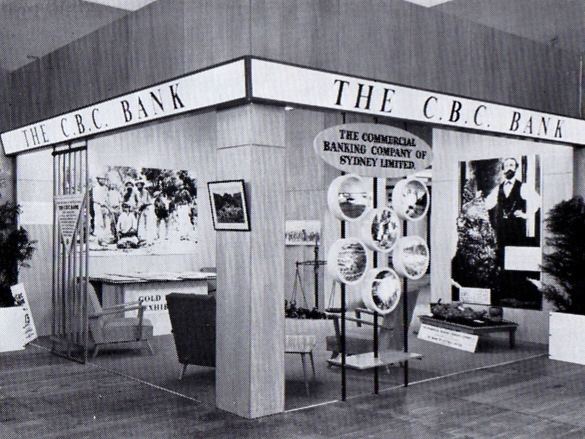 1963 July issue of Current Accounts depicts the Bank's exhibit at the second Melbourne International Trade Fair in the Melbourne Exhibition Building at Carlton. 1949 photo of Brunswick Street premises, sourced by Geoff Chapman. 1969 photo by L. Fowler from State Library of Victoria, sourced by Geoff Chapman. See also Balmoral Park, Frankston 1975 Listed in Annual Report. Photo by Kevin Greenaway temporary premises 1958/59. 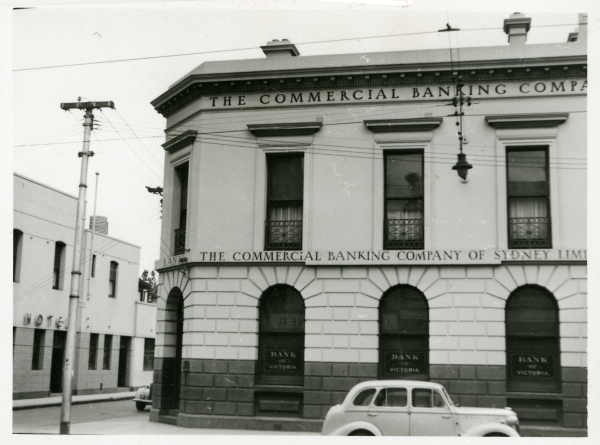 1948 First bank building Pascoe Vale Road from State Library of Vic (c) Broadmeadows Historical Society. 1924 a CBC employee named William Almeida who was shot by bank robbers in the Hampton, Victoria, Branch on 28th Nov 1924. Although mortally wounded he managed, with the help of bystanders, to detain one of the men until the police arrived. He died the next day. Newspaper reports conflict, but generally agree that it was in Hampton Street, less than 50m from Hampton Station, although one report says it was in nearby Orlando Street. None of them mention exact addresses. Submitted by Geoff Jamieson. 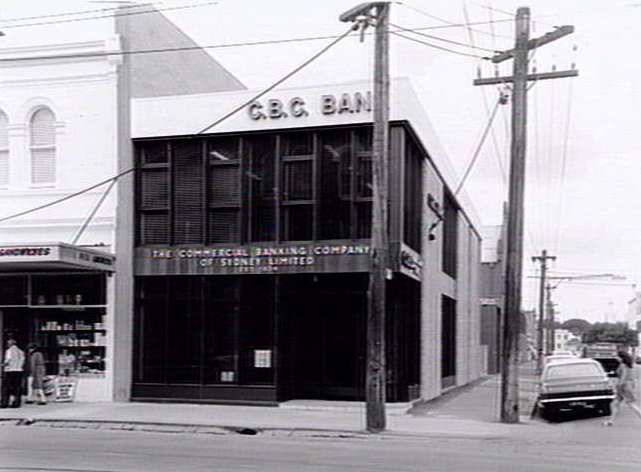 2012 February I'm interested in the story of a CBC employee named William Almeida who was shot by bank robbers in the Hampton, Victoria, Branch on 28th Nov 1924.What I'm interested in knowing is, would it be possible to obtain the address of that branch, so I can determine exactly where this all took place. I'm hoping that someone in your organisation might have a historical list of all the branches and thus might be able to tell me this detail. I think it would have closed soon after this event, as it was a one man branch, and after the trial of the felons, there was a lot of pressure on the banks to cease this arrangement. Many of these tiny branches would have closed or moved into larger premises soon afterwards. Geoff Jamieson. Moonee Ponds 1930-06-30 CBCofS Report states "Branch opened Mooney Ponds". Advised by John Beer. 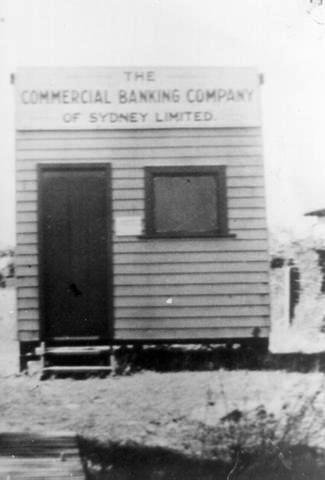 (receiving office of Cheltenham) 1934 Listed in Century of Banking. 1949 photo from Picture Australia. 1963 there is also a photo on Picture Australia. 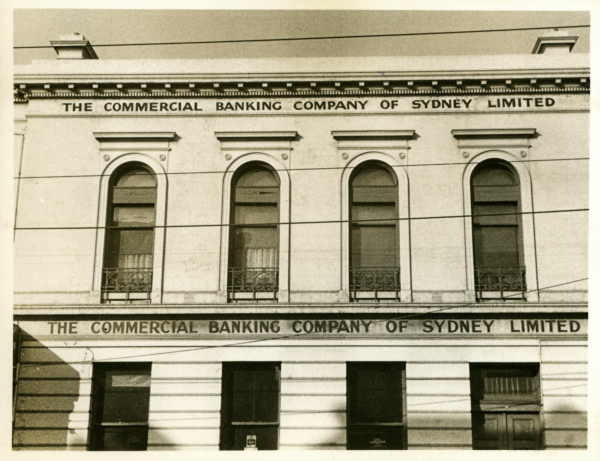 The Commercial Bank of Sydney (CBC), Prahran is eclipsed by numerous other banks in the same typology and any architectural importance inherent in the original design has been totally negated by the relatively recent, indifferent, and totally inappropriate alterations to the ground floor facade and banking chamber. Consequently, the building has been removed from the Register of the National Trust in Victoria. 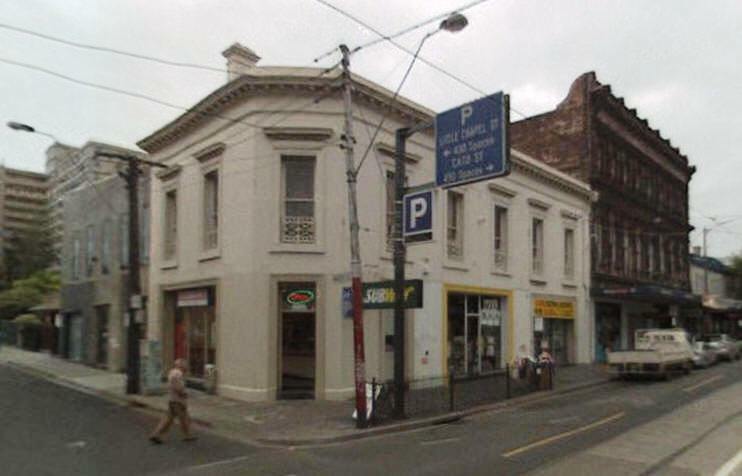 The surviving corner building is of minor local interest as a contributor to the vital Chapel Street streetscape. The CBC bank at 268 Chapel Street Prahran, formerly the Bank of Victoria, was erected in 1876 to the design of architects Smith and Johnson. 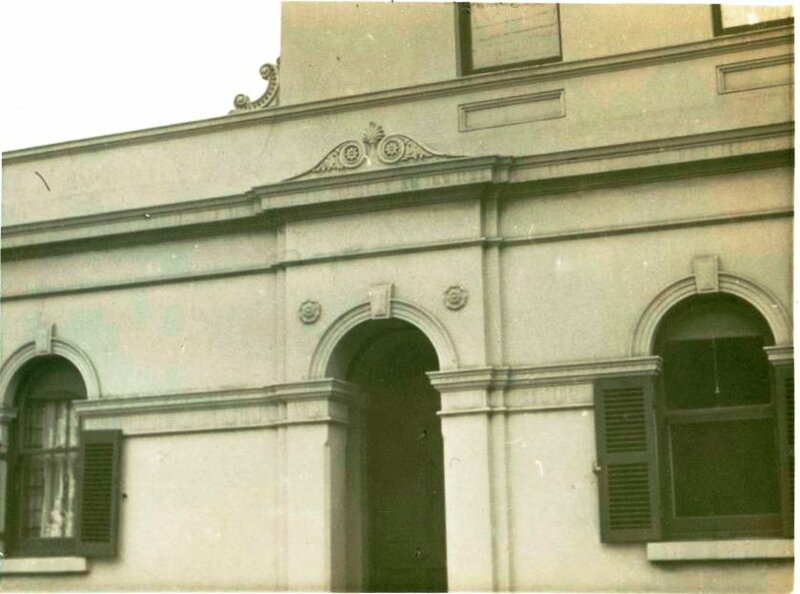 The two storey stucco rendered brick structure comprising ground floor banking chamber and first floor residence was, until substantial alterations were effected in 1961, a noteworthy example of the widely adopted Conservative Classic style of bank architecture. 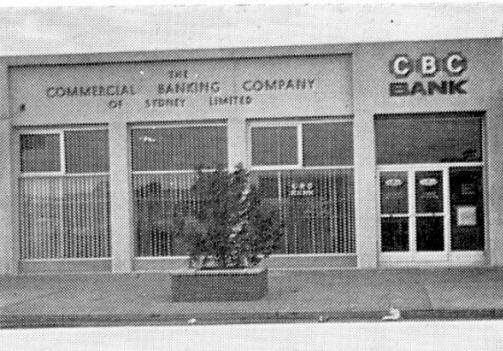 The CBC bank, Prahran, once a finely detailed and crafted structure in the conservative tradition, has been totally emasculated and is ineligible for inclusion on the Register of the National Estate. 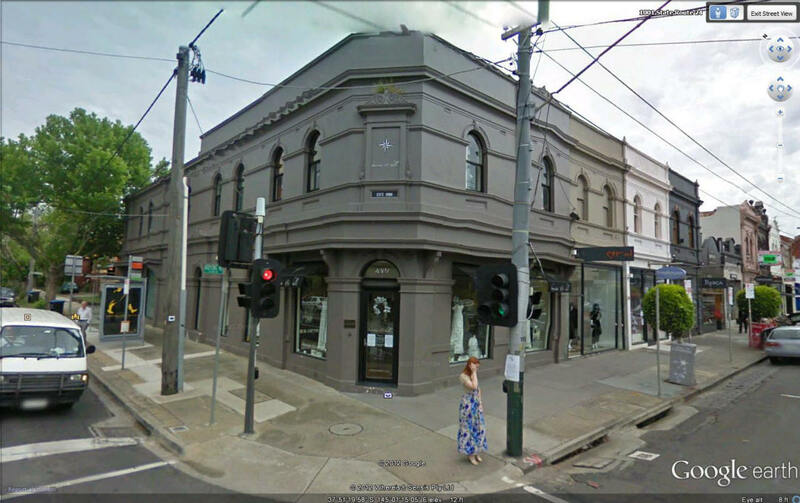 Location: 268 Chapel Street, corner Princes Close, Prahran. 1983 January List of Senior Staff lists CBC Manager & Accountant, whereas NBA 254 Chapel St had an Assistant Manager listed so obviously larger branch. 2009 June Googlemaps photos of CBC at 268 Chapel Street and unified NAB at 285 Chapel Street sourced by John Beer.